The 25 metre motor yacht Uno Mas, jointly listed for sale by Michael Selter and Neal Esterly at Fraser Yachts, is now sold. Built in GRP by Taiwan’s Horizon Yachts yard, she was delivered in 2005. Accommodation is for six guests in three cabins consisting of a master suite, VIP suite and a twin cabin, all with entertainment centres, televisions and en suite bathrooms. The main deck level includes a spacious saloon with full wet bar, an L-shaped settee, two barrel chairs, a coffee table and an entertainment centre including a 40 Sharp television. 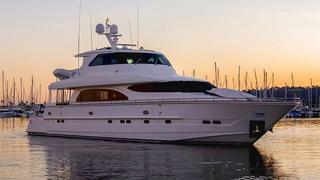 The galley of this yacht for sale is open with bar seating and country kitchen dinette. Forward and to starboard are stairs leading down to the forward cabin. Makore burl wood on the horizontal surfaces and straight grain Makore panelling on the walls create a warm, comfortable feeling throughout. The aft deck comes complete with a bar, seating and tables, making it ideal for al fresco entertaining and dining while the skylounge features a helm station, seating areas, 31 inch Samsung television and an electric sliding door to the boat deck. Twin Caterpillar C30 1,550hp engines give her a cruising speed of 20 knots and a maximum speed of 23 knots. Lying in Newport Beach, California, Uno Mas was asking $1,950,000.